According to the 2017 Retirement Confidence Survey, only 56 percent of American workers are currently saving for retirement. The survey also found that "a sizable percentage of workers say they have no or very little money in savings and investments." These statistics illustrate a critical role for advisors in retirement planning: helping clients catch up on retirement savings. One potential solution? The backdoor Roth IRA. 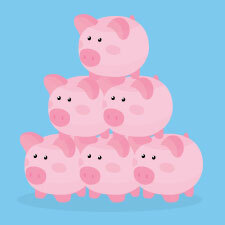 Helping clients catch up on retirement savings? Download our free guide to find the retirement plan that fits. How Does the Backdoor Roth IRA Work? Made possible by a 2010 provision to the Tax Increase Prevention and Reconciliation Act of 2005, the backdoor Roth IRA presents an opportunity for some individuals to potentially put away more money for retirement, in a tax-advantaged way. As you may know, contributions to a traditional IRA are tax-deductible—but only for individuals within a certain income threshold if they are covered by a workplace retirement plan. While individuals with income over the limit can still contribute, those contributions will not be deductible. For Roth IRAs, on the other hand, a similar income phaseout exists for those wanting to contribute, but there’s a twist. This backdoor Roth IRA contribution strategy can be highly effective for creating tax-free income in retirement, but it’s also quite complex. It’s important for you to understand the benefits, which clients are right for this strategy, plus potential tax implications and challenges. But for those clients who have been phased out of being able to contribute to a Roth in the usual way, there is an additional benefit: the ability to put away more money for retirement. Let's look at an example to help illustrate this point. A married couple in their 40s comes to you concerned that they didn’t start saving for retirement early enough and would like to catch up on their savings. They file jointly, are both employed, but have maxed out their 401(k) contributions. Neither of them owns an IRA because their MAGI has precluded them from making deductible IRA contributions, as well as Roth contributions. What can they do? With the backdoor Roth IRA strategy, they can each make a $5,500 (for 2017) nondeductible IRA contribution and immediately convert it, tax-free, to a Roth IRA. Let's say each of them contributes $5,500 annually over the next 20 years. With a conservative rate of return of 5 percent, they each could potentially accumulate $190,956! Who Are the "Right" Clients? Keep in mind that because the backdoor contribution starts with a contribution to a traditional IRA, your client must be younger than 70½. And there is one other factor to consider: whether or not your clients have an existing IRA. Individuals without existing IRAs. The backdoor contribution strategy works best for individuals who don’t have an IRA. Why? When they make a nondeductible contribution to a new traditional IRA and then convert it to a Roth, the conversion is tax-free unless there were earnings in the account during the time between the initial contribution and the conversion. As such, best practice is to convert immediately after making a nondeductible contribution. Individuals with existing IRAs. For individuals who have IRAs, things can be more complex although still beneficial. The pro rata rule requires individuals who contribute to and maintain money in multiple IRAs, including SEP and SIMPLE IRAs, to aggregate the account balances. If the IRAs have been funded with both nondeductible and deductible contributions, or if there is any pretax money within the accounts, income tax will be owed on the previously untaxed amounts. This means that individuals using the backdoor contribution strategy may owe taxes on the conversion. As you've likely surmised, it’s important to understand potential tax implications, how they’re determined, and how they’re tracked. Once there are after-tax dollars in one traditional IRA, all IRAs are affected, and any distributions or conversions must consist of proportionate amounts of both pretax and after-tax dollars until all the IRAs are closed. Here's an example demonstrating how this formula might play out for your clients. Your client, Jane, has $200,000 in aggregate IRA balances. Of that, $50,000 is composed of nondeductible contributions. Jane wants to convert $20,000 to a Roth IRA this year. Because of the pro rata rule, only 25 percent ($5,000) of the $20,000 will be tax-free. She now has $15,000 of posttax basis left over that will eventually come out tax-free. Filing rules. After-tax amounts are tracked and calculated using IRS Form 8606, Nondeductible IRAs. Anyone using the backdoor Roth strategy must file this form with the Form 1040 by his or her tax-filing date, including extensions. Be sure to let your clients know that failure to track after-tax amounts can have tax consequences. Specifically, if the after-tax amount of a distribution or conversion cannot be determined, it will be treated as if it contains only pretax dollars, and your client could be taxed twice on the after-tax portion. This makes it essential for clients to retain all 8606 and 1040 forms indefinitely, not just the recommended seven years, so they can always verify the nontaxable portion of distributions from IRAs. Although a simple retirement solution is to save early and often, this ship has sailed for many individuals. So, it’s important for you to understand all of the strategies available to help your clients catch up on retirement savings—or get ahead. When used properly and for the right clients, funding a Roth IRA with backdoor contributions can be a great way to boost retirement savings. What strategies do you use to help your clients boost their retirement savings? Do you think the benefits of the backdoor Roth IRA contribution outweigh its complexities? Please share your thoughts with us below.